The Fantastic Four are no longer calling the Baxter Building their home, instead they have moved into the Thing's old neighborhood on Yancey Street. The Buildings new address is 4 Yancy St. There is not much else known about the building or why iconic Marvel team moved there. However these is an awesome new variant cover showcasing the building by Valerio Schiti. The #4 issue is also said to introduce a new Super team called the Fantastix. This rival super hero team is said to be currently living in the Fantastic Four's old Baxter Building. I smell a super team fight brewing. 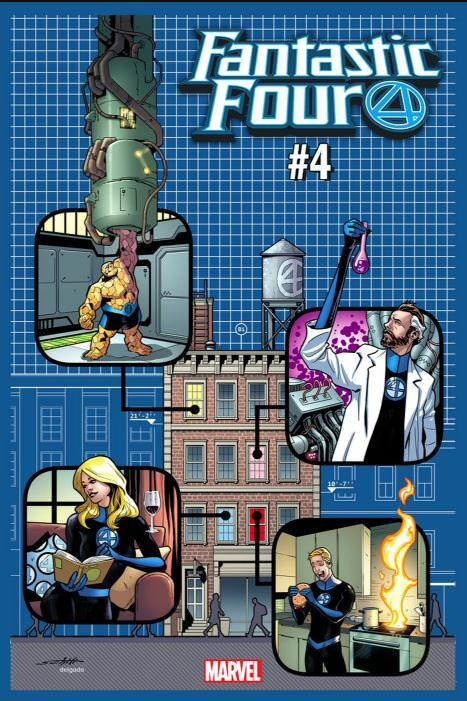 The launch of the new Fantastic Four #1 helped increase Marvel's July sales over the previous year. It remains to be seen if Dan Slott can maintain that excitement. into ongoing issues but stunning variant covers like this certainly help.